MOORSOM, WILLIAM SCARTH, soldier, civil engineer, and author; b. 4 July 1804 in Stakesby, Yorkshire, England, second son of Admiral Sir Robert Moorsom and his wife Eleanor; m. in 1831 in Halifax, N.S., Isabella Wilkins, daughter of Judge Lewis Morris Wilkins*; d. 3 June 1863 in London, England. After his education at the Royal Military College, Sandhurst, William Scarth Moorsom was commissioned an ensign in the British army on 22 March 1821, and joined the 69th Regiment on 7 Nov. 1822. He went on half pay in the Cameron Highlanders before being raised on 8 April 1826 to captain in the 52nd Regiment, which he joined in Nova Scotia the following August. Before Moorsom returned to England with his regiment in 1831, he had explored most of mainland Nova Scotia, mapped Halifax harbour, commanded the small army detachment in Prince Edward Island, and served as acting deputy quartermaster general for the Nova Scotia command from November 1830 to September 1831. As a result of his explorations, Moorsom published in 1830 Letters from Nova Scotia, comprising sketches of a young country. Written sententiously in the form of letters to friends in England, this volume of observations on the people, climate, geography, and economic prospects of the colony is the most complete picture available of Nova Scotia during the 1820s. 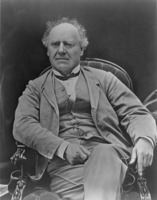 A few cursory judgements and his derogatory comments on their society drew an angry reaction from some Nova Scotians, but Joseph Howe* pleaded in the Novascotian that the author be forgiven since he had helped to publicize the colony in England. On 2 March 1832 Moorsom sold his army commission to care for his father, hoping to return to Nova Scotia shortly and settle on the land he had purchased in Hants County. Instead he sold the land in 1835 and was drawn into the English railway boom, developing a wide reputation as an excellent surveyor and engineer for several railways laid out over difficult terrain. Although Moorsom never returned to Nova Scotia, he maintained a keen interest in the colony. In a letter to the Novascotian in 1835 he advocated a railway for Nova Scotia but did not press the matter again until 1844 when he drew up concrete proposals for a line between Halifax and Windsor. His ideas were picked up by Sir Richard Broun and William* and George Renny Young* who began to promote the construction of such a line in 1845. In two prospectuses placed before the public in the fall of that year Moorsom was named engineer-in-chief for the Halifax and Windsor Railway and one of the engineers for the Halifax and Quebec Railway. During the ensuing political fights over the merits of these two lines, Moorsom, unlike his associates on the provisional committees, never received criticism. Because of the nature of his assessment of the colony’s prospects in Letters from Nova Scotia and his previous engineering experience, no one questioned his affiliation or judgement. The political squabbling among the promoters of these lines and between Liberals and Tories destroyed public confidence and neither railway was incorporated. This was Moorsom’s last flurry of involvement with Nova Scotia. Henceforth he directed his energy to engineering contracts and prolific writing for the Proceedings of the Institute of Civil Engineers. Shortly before his death in 1863 he published a Historical record of the Fifty-Second Regiment, a typical regimental history. PANS, MG 12, HQ, 27–29; RG 1, 455, 456. W. S. Moorsom, Historical record of the Fifty-Second Regiment (Oxfordshire Light Infantry) from the year 1755 to the year 1858 (London, 1860); Letters from Nova Scotia, comprising sketches of a young country (London, 1830). Acadian Recorder, 7 Jan. 1826–22 Oct. 1831, 3 Aug. 1863. Halifax Morning Post, 8 Nov.–23 Dec. 1845. Novascotian, 4 Jan. 1826–26 April 1832, 13 Jan. 1836, 3 Aug. 1863. DNB. Carol M. Whitfield, “MOORSOM, WILLIAM SCARTH,” in Dictionary of Canadian Biography, vol. 9, University of Toronto/Université Laval, 2003–, accessed April 21, 2019, http://www.biographi.ca/en/bio/moorsom_william_scarth_9E.html.